Spark Networks’ previous acquisitions have focused on niche dating services. With the acquisition of Zoosk, the company is realigning its goals to focus on expanding its mass market appeal and scaling its presence in the world’s largest dating market. The agreement is expected to generate two-thirds of the combined company’s revenue in North America and drive substantial adjusted EBITDA margin expansion. In 2020, Spark Networks expects Adjusted EBITDA to exceed $50 million. Spark Networks also hopes the acquisition will increase its ability to innovate and deliver sustainable long-term shareholder value creation. “Our acquisition of Zoosk is the most transformative deal in our history, and we expect the transaction to immediately strengthen our position in the online dating market,” said Folgueira. “With the increased scale that results from the combination, we see a clear path to profitability improvements and greater opportunity to invest in innovation and growth initiatives that will drive shareholder value." Steven McArthur, Zoosk’s CEO, added: "We are excited to help create such a broad and powerful portfolio of brands that will address specific user needs in the dating market globally, while leveraging the best of both companies to create a world-class platform to serve customers across these brands." Spark Networks SE will remain the parent company. Zoosk, Inc. will become a subsidiary of Spark Networks SE. 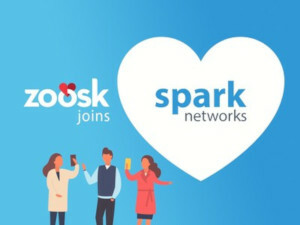 The existing Spark Networks executive team will manage the combined entity with Zoosk CEO Steven McArthur joining the company’s eight-member Board of Directors. The transaction is expected to close early in the third quarter of 2019. Currently on Zoosk.com, the dating service reports that they have 40 million users who send 3 million messages daily. The Zoosk dating app also has been download more than 30 million times. For more about this service you can see our Zoosk Statistics and Facts page, and read our Zoosk review.